I noticed this morning that Starbucks is already using their holiday cups (this was written in 2012, well before the current cup controversy). Everywhere, retailers are ramping up their Black Friday and Cyber Monday sales pitches in preparation for this holiday season. While some people are grousing about stores jumping the gun on Christmas music, others can hardly wait. There’s a certain optimism in the air this year. People are ready to shop again. Last year, Cyber Monday surpassed Black Friday in sales, so expect more email competition than ever this year. This is, for many retailers, the most important time of the year for their email to get through to their clients. For some retailers, the holiday season represents up to 40% of their annual sales. On average, it represents close to 20% of annual sales. Email sending increases during the final weeks in October and really gets going in the weeks before popular sales events, such as Black Friday and Cyber Monday. Retailers increase their send volumes by 47% on average. 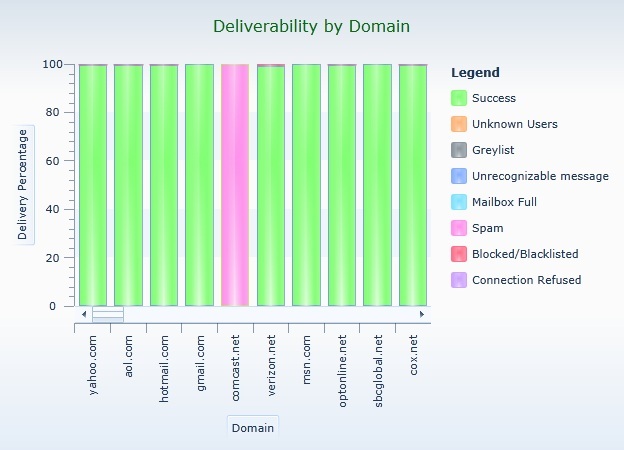 As a consequence, email services such as Gmail and Hotmail also ramp up their efforts to eliminate spam by tightening up their restrictions and by requiring higher reputation scores for received mail. So what does that mean to you? For most people, probably nothing. If your clients have been engaged in the past and you’ve never had any trouble getting your email into the inboxes, then the holiday anti-spam measures of the folks at Google, Microsoft, and Yahoo won’t matter much. But if your reputation score is already close to the edge of acceptability, you might suddenly find your email winding up in junk folders more often than it had a month ago. This also means it is very bad time of year to be experimenting with list purchases and appends. Now would be a good time to pull up your reports and look at your metrics. Do you have any problem areas? In the example below, everything sent to comcast.net is ending up in the spam folder. Since the other domains are showing good results, the next question becomes, how many of my recipients are using this service? If for instance, you are sending out 750,000 email and three are getting block by Comcast, then this isn’t much of an issue. If, on the other hand, Comcast received 500,000 of that mailing, then you better take actions to correct this ASAP. The sad truth is that if you haven’t been paying close attention to these metrics all along, by the time November rolls around you are probably much too late to do much to help turn things in time to help your Christmas sales campaign. Nonetheless, there are still things you can do to improve your email marketing efforts during this holiday season. Here are the main ones. This is an area where many businesses fall down every year. If a recipient opts to stop receiving email from you, sending that person your holiday specials will not be looked on kindly. In some cases, this isn’t the fault of the business, but of their ESP. Many email marketing systems require you to create separate lists for each segment you create. You create a segment of men over forty and that’s a list; you create another segment of women under thirty and there’s another list. If you are using email marketing software that requires you to create separate lists for segmentation and topic categories, your chances of resending to people who have opted out of your list are increased geometrically. 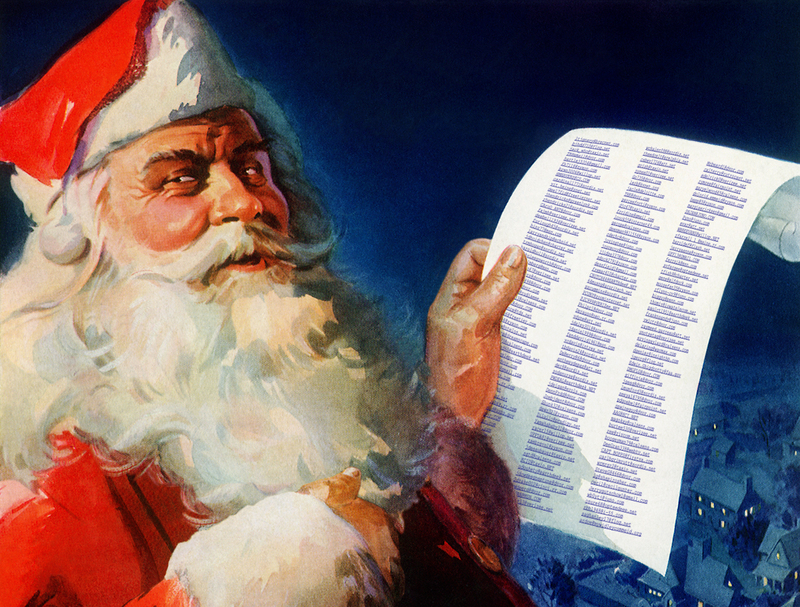 You’ll need to go through those lists carefully and make sure you haven’t made this mistake. If you are using Symphonie, this isn’t an issue as unsubscribes are always respected, even across segments. While it is unquestionably important to strike while the iron is hot, don’t overdo it. Even at a time year when people expect more sales-related emails, they don’t want to feel overwhelmed. People expect more email at this time of year, but how much you send needs to stay in proportion to your normal engagement. If you been sending notices a couple of times a week, then daily emails might be acceptable, but if you’ve only ever send a recipient one email every two months, the sudden appearance of daily emails might cause the recipient to react negatively. It is far better to send a few emails with compelling sales pitches than tons of mediocre ones. By keeping close track of your metrics, you can correct these potential problems before they occur. If your opens and clickthroughs are showing dips when they are sent too close together, pull back on the sending a bit and see if that helps. Since everyone is getting more email now than at any other time during the year, more email is being deleted before it is ever opened. People decide in an instant whether they want to read your email or not, and that decision is based almost exclusively on the subject line. If you fail here, it won’t matter how good your content is. Like the first sentence in a story, the subject line should intrigue the recipient enough to keep reading. If you aren’t doing so already, this is good time to use A/B splits to test various subject lines for their response rates. You may have an idea of the exact time that you want people to receive your mailings, but keep in mind that most ISPs will begin to greylist more email as the volume of email increases over the holiday mad rush. They do this to manage their loads and slow down those senders without stellar reputation scores. But if the delay is long enough, it can mean that your email won’t land in the inbox until it’s too late. Your ESP should offer a feature to stop delivery attempts if the email isn’t delivered by a specific time. There have been cases of one-day-only sales appearing in mailboxes the day after the event. Give your recipients a few days head start. People are far more likely to read your email if they feel like you are talking to them personally. Don’t neglect to use your merge and dynamic content features to make each email seem like it was hand written expressly for that recipient. For more on this topic, see Personalizing Your Email Marketing. Is your reputation score satisfactory? If not, contact any ISPs that presents problems to resolve this issue. If you have multiple lists, make sure all the global unsubscribes have been removed from those lists. Sending more email is okay, but don’t overdo it. The subject line is more important than ever. Always allow enough time between a mailing and a specific date to allow for possible ISP greylisting. Personalize the email with dynamic content when applicable. Do these things and your email should arrive on time in the inbox and ready for the season. This entry was posted in Deliverability, Design, Dynamic Content, Email marketing and tagged animated gifs, Black Friday, Christmas, Cyber Monday, holidays on November 19, 2012 by Jim Morton. Should You Use Mosaics in Email? Using tables to create images where none are allowed. A hot new topic in digital marketing is the use of mosaics to create images in email browsers where displaying images is turned off. Most email browsers, such as Gmail and Outlook, default to leaving images turned off. That means when you receive an email, any images in the email show up as empty boxes with some alternative text in place of the images (a good reason to always make sure your alt tags are always descriptive). A clever solution comes to us from Style Campaign in the form of their BMP to HTML Converter, which they offer as a free download on their website. As you can see, the results are impressive. Suddenly you don’t have to worry about whether or not your images will show up. You can add visual information to any email, and visual information has a better chance of translating into sales. There nothing wrong with the mosaic, it’s just too much information stuffed into too small a space for a visual HTML editor to handle. Even here on this blog, I had to use a screenshot instead of the mosaic because the HTML editor for WordPress simply couldn’t handle the table. Visual HTML editors, such as Dreamweaver, want to show you the boundaries of each table cell and there’s simply not enough room to do so. The end result is a file that, while it may send okay, requires much more caution and testing before approval. Also keep in mind that stuffing your email with tables this complex makes for a very large email file. So large, in fact, that some services, such as Gmail, may lop off part the file if you’re not careful, leaving you in a worse situation than if you’d actually used image files. In the case of our logo, the PNG file comes in at 10Kb compared to the HTML table version, which is 93Kb, and that’s before you’ve added a single line of text. The Goolara logo is a relatively small file—168 pixels by 75 pixels—but even here, we found that the email we sent was clipped after the mosaic in Gmail and Yahoo. Both of these programs required me to click a link in the display before they would download the rest of the message, which is much more confusing than the standard message about images being blocked. In the case of Gmail, the mosaic was slightly clipped as well, causing some artifacts at the bottom of the image. File size is the real problem with mosaics. The reason ISPs block images is because images require the browser to fetch files from the sender’s server, alerting them that the person has opened the email. To protect the privacy of their clients the ISPs allow each person to decide whether or not they want to see the images in an email. Privacy is not the issue with mosaics; it’s bandwidth. Say you send out 500,000 messages every week and each email, without the images, runs approximately 5Kb. That’s pretty big for an email already, but at that rate your sending out 2.5 Gigabytes of data. Now add our little 93 Kb image to that file and the number jumps to 49 Gigabytes! Suddenly you’re taking up almost twenty times the bandwidth to add a tiny image to the email. One way around this is to reduce the resolution of mosaic drastically, but then you end up with an email that looks like an Atari video game from 1982. Beyond the bandwidth, the ISPs now need to store a message that is 20 times bigger than the previous average. If many companies started to use this technology you could see that the cost to ISPs for storage and bandwidth could become quite significant. These are all pretty big caveats. Right now, you should approach this technology with caution and use it only on images that are either very small, or are intentionally low resolution. Even so, you should keep track of your file sizes and remember that the bigger the file you are sending, the greater the opportunity for things to go wrong. This entry was posted in Design, Email marketing, Trends and tagged bandwidth issues, large files, mosaic, tables on November 6, 2012 by Jim Morton.